Here's an oldie but goodie, that keeps coming up for me rather frequently. I've been working with IIS on Windows for a loooong time and I have a number of products that go way back that run on IIS. As a result I deal with a lot of support issues around IIS and people who install IIS run an application for years, have their servers eventually break down and then have to reinstall years after their last install. And a lot of times the people who set up the system are long gone. The chief complaints I hear frequently is that it's a pain to get IIS to install initially with all the right components. I tend to agree - especially on Server versions installing IIS through the insanely user hostile Server Manager interface is a pain. But there's an easier, quicker and repeatable way if you're willing to dive into the command line or create and run a small Powershell script. 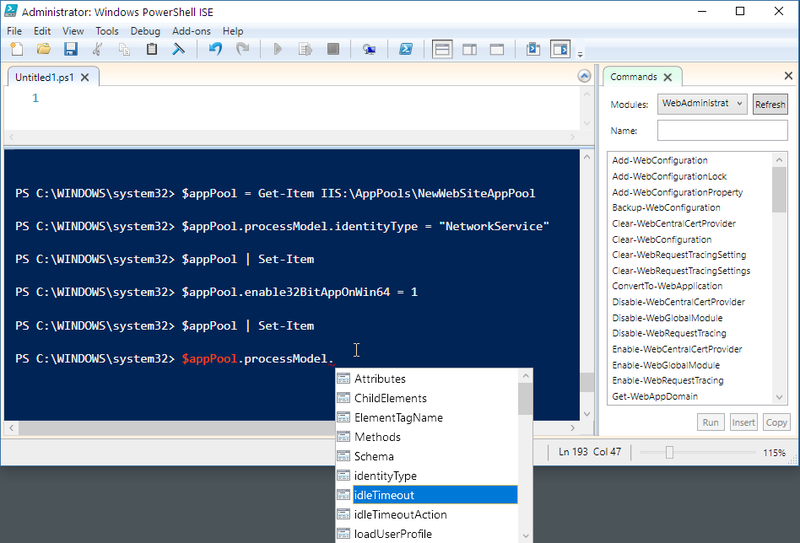 Apparently many people are unaware that in recent versions of Windows - using Powershell - you can automate the IIS Features installation using a few simple Powershell Commandlet calls. It's as easy as creating a small PowerShell script file and letting her rip. You can use the Enable-WindowsOptionalFeature command to install IIS Features as well as any other Windows Features. This command works both on desktop and server versions (server versions also have Enable-WindowsFeature which has the same effect) and makes it pretty easy to automate an IIS install by whittling away a few commands in a Powershell script file. # run West Wind Web Connection. # * Make sure you run this script from a Powershel Admin Prompt! # * YOU MAY HAVE TO RUN THIS COMMAND PRIOR TO RUNNING THIS SCRIPT! You can tweak and fiddle with the features you actually need for IIS, but the above is pretty standard for my base installs. What Windows Optional Features are Available? Enable-WindowsOptionalFeature is great, as long as you know what's available. Luckily it's easy to figure out what's available and what's installed and what's not. Once installed it's easy to create a new WebSite and Application Pool. $appPool = Get-Item -name "NewWebSiteAppPool"
$site = $site = new-WebSite -name "NewWebSite"
The Intellisense in the editor and the command window gives you live property values on commands and even live objects as shown in the Figure 1 which makes it relatively easy to figure out settings. For the rest the various cmd-lets and admin objects are well documented and searchable. None of this is new of course, but it's always good to be reminded that you can automate installation and configuration of IIS relatively easily. This is especially true since I just this week I heard from several people how much of a pain IIS can be to install and get up and running. It doesn't have to be this way... the tools are there. Very useful Rick! For some reason IIS does not come as standard with the very useful feature to import an application as a ZIP file and Microsoft make it super hard to find the link to download that add-on. It forces you to first install the "Web Platform Platform Installer Platform" or something, and then find an obscure link. I'm guessing that can't be done from PowerShell, but it sure would be useful. Web Deploy can be downloaded without WebPI (https://www.iis.net/downloads/microsoft/category/deploy-and-migrate). While it is possible to use PowerShell (or any other scripting toy, or msiexec) to get the bits installed, the installer's user interface is the only documented way to fully customize the setup. This looks good, Rick. I ended up doing something similar with Desired State Configuration (DSC) to configure IIS the way that I wanted. https://msdn.microsoft.com/en-us/powershell/dsc/windowsfeatureresource This simplifies the re-running of my configuration script, but doesn't always provide the level of granularity that I need. I combined it with non-DSC PowerShell that manually checks to see if things are already configured, and now have a re-runnable script that I can run on my "pet" servers. Maybe this will become less important once I start treating my servers more like cattle, and stand up new ones every deployment. @Jan - use Get-WindowsOptionalFeature and look through the list - it's in there. See how I query for features not installed int the post. Thanks for posting Rick, very useful. Nice! -- I noticed a couple of these error out because a parent feature is not installed; it looks like if you add the "-All" switch to end of each of the "Enable-WindowsOptionalFeature" commands, then you will not encounter this issue (also, some of the commands are listed more than once, I'm guessing that was to combat this issue, but with -All, it's not necessary anymore). you have to put the Enable-WindowsOptionalFeature -Online -FeatureName IIS-ASPNET45 as the last line of the script: instead you'll get a registry error (which probably is the "One or several parent features are disabled so current feature can not be enabled." on Winsrv 2016 ) Thanks! Super article Rick, Thanks ! is there a way to figure out what minimal set of components are required, by looking at the web.config of a webapp? @anupam - Nope - not really. You know you'll need ASP.NET which means you'll need most things I mentioned above but it's still on a case by case basis to pick out what you need. A couple of failings here: You never once mention how/where to get "WebPlatform Installer;" nor "chocolatey" I love chocolate; but you seem to have built-in assumptions that all readers magically know what there are and where to find them. One commenter at least provided a link to WebDeploy. Those are essential refernces, if you expect readers easily be able to easily follow this. That said, this is AMAZING work - nothing short of 'really cool!'. I've used this quite a bit since you first posted it. THANK YOU! So, what is this magical "WebPlatform Installer" - is it an MS piece? Another feature? Where can I get it? And, same question for "chocolatey" - I will Google for these vs. waiting for a response, but ??? @Josh - you are right in that I make some basic assumptions here. This is a developer Weblog and I post developer stuff and if you're not a developer dealing with this stuff this blog will be a slog. I love powershell for installing almost everything now. This one works flawlessly for a standard Laserfiche Web deployment. Thanks so much!